I would like to thank all those schools who have donated money to the Rwanda Project during this year. All donations, no matter how small, are valued and every penny is spent on meeting the projects identified by Sister Susan and myself. Much of the fund raising for this work goes on during Lent, but I am more than happy to receive contributions at any time of the year... the money is greatly needed! These should be sent to the BCPP Office. Cheques should be made payable to: BCPP - Rwanda Account. Sister Susan returned from Rwanda in mid-June and will be returning in the middle of August. I shall be meeting her during the summer holiday to plan projects for the coming year. Sister reports that there are many changes taking place in Rwanda at the moment at national level. This year the government’s emphasis is on the improvement to housing. Huts with grass roofs are no longer allowed and there is now a requirement for these to be replaced by metal sheets or slates. The government is also encouraging people to build larger homes and to come together in villages to put more infrastructures in place. Another project that the government has been working on for the past few years, has been the installment of electricity throughout the country. On Christmas Eve, the area around Sister’s convent and the schools at Kiruhura were able to benefit from electricity for the first time. In October 2010, the Birmingham Catholic Primary Partnership (BCPP), transferred £23,000 to the Sisters in Rwanda. Seven students, supported by the BCPP in past years, commenced their studies at university in 2011. 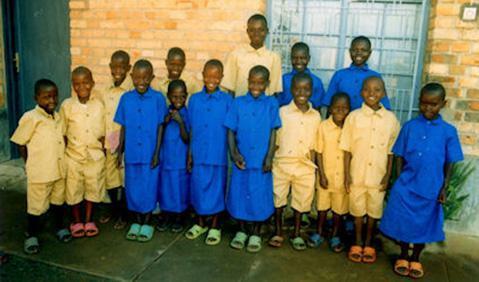 Children are now required by the Rwandan government to wear school uniform and footwear if they are to attend school. In addition, they must equip themselves with notebooks. For some families, this is too much of a financial burden and in these cases, Sister Susan has intervened to make sure that these pupils have the necessary equipment to allow them to attend school. £1000 has been used to meet these costs. Primary school children at Kiruhura in new uniforms and footware. This year the BCPP undertook the funding of a major building project of two classrooms at the school in Kiruhura. A new headteacher has been appointed to the school and, as a result, there were delays in the construction of the classrooms. However, the work is now finished and the two classrooms are ready for use. The completion of this work has allowed a nursery class to begin in one of the freed up older classrooms. The work was completed, on budget, at a cost of £15000.00. The new classrooms have been equipped with desks, blackboards etc at a cost of £1000.00. The desks were made by the students involved in a carpentry youth project, which was supported by the BCPP last year. There are almost one thousand, two hundred students in the primary school and they are split into two groups, one studying in the morning and one in the afternoon. The day is long for the teachers, as they begin at 7.15am and finish at 5pm. However, the system encourages more parents to send their children to school because they can also help with the work at home or in the fields. Completion of walls of primary classes. Completion of metal roof on classrooms. Classrooms with the roof in place. A student prepares the wood for one of the desks.